We developed our Careers in the Theatreguide, which uses those involved in the creation and development of Ghost The Musicalas primary source material, to introduce students to the wide range of career opportunities in the theatre. Most students think primarily about acting when they consider a career on the stage but there are more than 60 different jobs in the theatre. 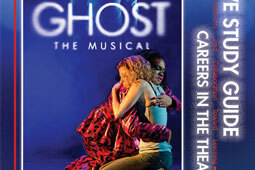 Our publication focusing on Careers in the Theatre includes the definition of 60-plus jobs, an explanation of the theatre hierarchy, links to professional resources and video clips of career advice and insights from more than a dozen individuals who worked at creating Ghost The Musical. You’ll also find biographies of those involved in the process of bringing Ghost The Musical to Broadway and a description of how this musical was brought to the stage over the course of a six-year process. This free guide may be used without seeing Ghost The Musical, and although it focuses on this particular production, it is useful as a resource for anyone interested in learning more about how the theatre works and how he/she may work in it.